During the week, I tend to make the same old things for dinner; salmon, shrimp, and an occasional roasted chicken from Whole Foods. It’s fast and nutritious, but a bit dull at times. The CSA box is pushing me outside my comfort zone, and challenging me to use what is at hand to whip up dinner. 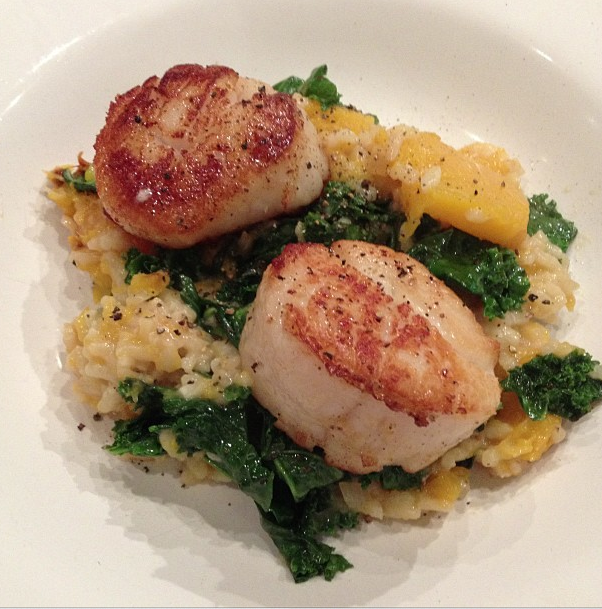 Tonight, I used the butternut squash and kale, in a rich risotto with seared scallops on top. It was comfort food at its best. Delicious, but simple enough to allow the flavors of the farm fresh ingredients to shine. Halve the squash and rub it with a little olive oil. Roast it in a hot oven for about 45 minutes, until it is soft. Scoop out and discard the seeds, and skin, and cut the squash into small cubes. * I only used ½ of the squash. Wrap the other half up for another use. In a large pot, sauté one small diced onion in a little olive oil and butter. Add 1 or 2 cups of Arborio rice (depending on portion size) and stir until the rice is about to brown. Add 1cup or so of chicken or vegetable stock and white wine to the pot, and stir until it is absorbed. Keep doing this for about 20-25 minutes until the rice is tender, and almost porridge-like. It is not necessary to stir it every minute, but be careful that the liquid does not cook out while it is unattended. Stirring also helps get the desired creamy consistency. Stir in some grated Parmesan cheese and freshly ground black pepper. While the rice is cooking, wash a couple of handfuls of the kale and cut it into bite-sized pieces. Sauté it in a bit of olive oil with some salt and pepper for a couple of minutes until it starts to wilt. Set aside. Gently mix the squash and the kale into the rice mixture. Serve in bowls and enjoy! This entry was posted on October 5, 2012 at 7:06 am and is filed under Food. You can follow any responses to this entry through the RSS 2.0 feed. You can leave a response, or trackback from your own site. That photo really drew me in. I love scallops and the idea of kale and butternut squash with it.